Feng Shui is the ancient Chinese art that brings balance to all things in life. For thousands of years, believers have expected to live a life blessed with happiness and prosperity. It is said that the ancient art of Feng Shui harnesses the seen (our surroundings) and the unseen (energy) to help you navigate your way to clearer waters and maintain a happy balance in your life. 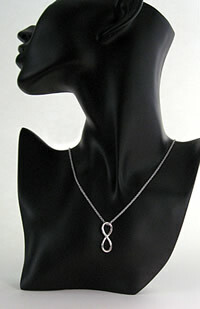 The Infinity Symbol (The Figure-8) represents Unlimited Happiness in Feng Shui. This stunning amulet, made of pure Sterling Silver, may attract positive energy to bring needed balance to you life. Wear it or carry it with you at all times, and be prepared for good things to happen. In our normal day-to-day routine, we are often confronted with negativity. Whether due to people or situations in our lives. Subconsciously, we get anxious and are thrown out of balance, corrupting ourselves and our happiness in the process. But if we surround ourselves with beauty, kindness and the sweetness of life, we can live in harmony and attract the positive forces. This is the true essence of Feng Shui. The Feng Shui Symbol of Unlimited Happiness Amulet is made of pure sterling silver. I ordered this necklace for a friend. She loves it. It’s beautiful and she said she feels good, happy when wearing it. I bought this necklace (Feng Shui’s Symbol of Unlimited Happiness) a few months ago, and I am very pleased on what it brought me after wearing it. Help came to me without any difficulty when I least expected them. Initially, there were some problems at work for some months. After wearing this amulet for some time, they eventually worked out and went smoothly for me. Thumbs up! Will definitely return when I need help in other areas. I’m so pleased by my successes that I could burst! I bought a Feng Shui Unlimited happiness amulet and have had nonstop job opportunities ever since, with employers actually contacting ME, as well as endless hours of regular work at my “as needed” position to keep paychecks coming in while I decide on regular employment. And my current love also decided to move in because he misses me so much while we’re apart! I’ve been using your spells for over 10 years, off and on, and I love the services. I have never been disappointed! Thank you so much! When I received the figure-8 I felt so so happy. It looked small on my palm but so adorably cute. I feel carefree and so happy when I wear it. Thank you so much! I will definetly buy here again.